The 2019 nominations for the Gadabout Gaddis Cup Award are now open! The Gadabout Gaddis Cup Award is presented bi-annually at the Bingham Airport to an individual or organization that contributions significantly to the well-being of Maine’s aviation communities. 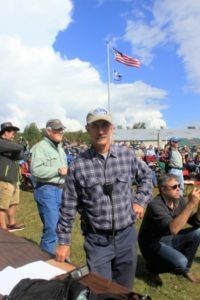 2017 Gadabout Gaddis Cup Award presented to Keith Strange of Lincoln! 2015 Gadabout Gaddis Cup Award — Lisa Reece of Wiscasset! 2013 Gadabout Gaddis Cup Award — Max Folsom of Greenville! 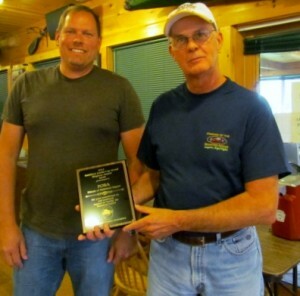 The 2012 Gadabout Gaddis Cup was awarded to the Friends of Biddeford Airport (FOBA) on September 30 in Bingham, Maine. The annual luncheon takes place at the Gadabout Gaddis Airport and is hosted by North Country Rivers. Jim Murton and his staff at NCR welcome the group each year to the restaurant located on the field. Founding member and past chairman of FOBA Lannie McGahey and current chairman and Biddeford airport manager Frank McCutcheon accepted this historic award on behalf of the organization. FOBA was formed in response to a citizen referendum to close the Biddeford Airport. The group was overwhelmingly successful in defeating this 2008 vote. Due to the efforts of FOBA along with EAA 1210 chapter which is based at the airport the group raised awareness of the importance of the airport by going door to door and organizing an open house. The Biddeford Open House is held every other year, and the 2013 event is in August. Special thanks was given to Jerry Bernier founding member and past chairman of FOBA for his tireless efforts in getting the group off the ground and for helping “save” this important part of the Biddeford community. Over 20 people attended the 2012 luncheon including FOBA and EAA 1210 members (many of which are also MAA members). 2011 Gadabout Gaddis Cup Award Winner — Phil Simpson of Wiscasset. Simpson, a former co-pilot for the state, was the assistant director of aviation for Maine from 1972 until his retirement in 1996.